A family of four was sleeping today in their two story apartment, when they were alerted to a fire downstairs by activated smoke detectors. The noon time fire was rapidly growing, when the two adults and children exited down the stairs, passing the fire on their way out of the apartment. Seven fire companies were initially dispatched to this incident located at 2524 N. Haven St.. Responding apparatus reported a heavy dark column of smoke in the distance, and the responding Battalion Chief requested two additional companies be placed into the call. Fire crews from Station 15 and Station 2 arrived within seconds of each other. Command was established by the company officer from Ladder 2. L2 reported a two story triplex apartment with heavy fire showing on the first and second floors of the middle unit. Crews immediately advanced hose lines to this center unit and a search of the building was started to verify that everyone was out. Arriving fire crews were assigned to back up Engine 15 whose crew was attacking the main body of fire and to provide a water supply to their engine. Additional hoses were brought into play to confine the fire from extending into the adjacent apartments, and protect another large structure that was a potential exposure hazard at the rear of the triplex. Roof ventilation was performed to release heat and control the spread of the fire from moving across the common attic. 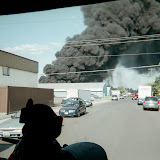 This fire was brought under control within twenty minutes by aggressive fire fighting by the Spokane Firefighters. The fire was confined to the apartment of origin and the attic space above it. This fire unit sustained heavy loss throughout. Both adjacent apartments sustained smoke damage. There were no injuries at this incident. The family escaped with each other and the belongings they carried out with them. The family is being assisted by the local Red Cross. The Red Cross continues to provide a wonderful service, assisting those who have lost everything in events like this. The cause of this fire is still under investigation. The Spokane Fire Department wants to emphasize the importance of properly working smoke detectors. This time of year, we recommend that every family check their smoke detectors and replace the batteries. We encourage them to go through this process again in the fall when we move back out of "daylight savings".